Use the Select Survey drop down menu in this portion of the Survey Editor to access a previously created Survey. Create a Survey: We shall review this below. Modify a Survey: When you wish to modify a survey, you will use this portion of the interface to do so. 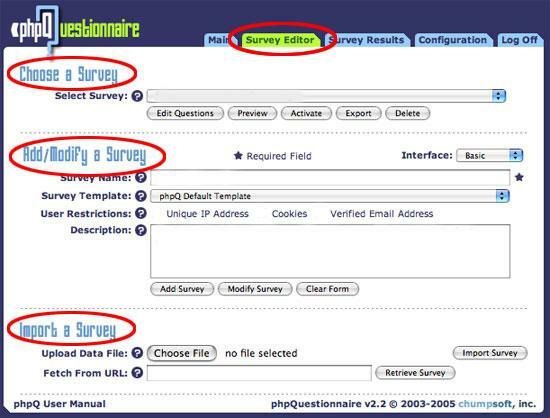 Allows you to import a previously created phpQuestionnaire survey. Now that you have become familiar with the overall interface, let’s add a new survey to phpQuestionnaire. As stated above, this is the portion of the Survey Editor interface where you will add a new survey to the system. Note: phpQuestionnaire provides two interfaces for Survey addition: Basic and Advanced. The Basic interface is strongly recommended for Survey addition; it gives you the quickest access to the most important details of survey creation. The Advanced interface not only allows you to stylize certain aspects of your survey, but it also allows you control distribution and publicity of your survey’s results. For more information about this please contact either Dale David or Debbie Faires. Survey Name: Create a name for your survey (in this example, we have chosen LIBR 200 Survey as the our Survey name). For this example in survey creation, we shall implement the Verified Email restriction. Description: This field contains text that will be displayed on the Main page which lists all surveys. It is only there if you wish to provide a brief summary of the purpose or contents of this survey. Once you have filled in all the fields listed above, click the Add Survey button. Upon clicking the Add Survey button, your newly created survey will appear at the top in the Choose a Survey portion of the Survey Editor interface. In the Select Survey drop down menu, your survey’s name will appear with the creation date appended to it. By default, all surveys are Not Active until you are ready to activate it. For more information, see the tutorial called Activate/Deactivate Survey.